Last week, Under Armour continued its partnership with The Heart of America Foundation to transform schools in Baltimore City. 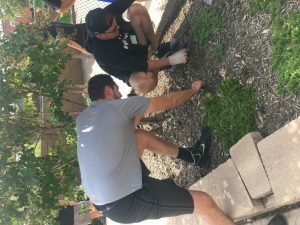 From September 11-15, more than 1,200 Under Armour teammates worked to beautify Thomas Johnson Elementary/Middle and George Washington Elementary Schools. Members of our office also took part in the fun! 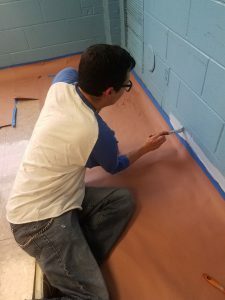 On the morning of September 14, Bruce and Sandy joined the team at George Washington Elementary to paint and help transform the gymnasium, cafeteria, hallways, and exterior. Bruce also enjoyed handing out lunches to students! In the afternoon, Dave, Harry, Jordan, and Sandy assisted in the transformation of the exterior of Thomas Johnson Elementary/Middle. Jordan successfully proved one of the other volunteers wrong by moving a bag of mulch he didn’t think she could lift! 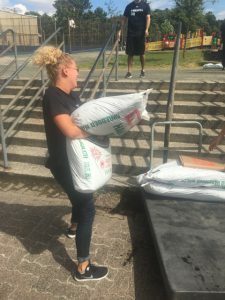 Jordan showed off her strength by moving this 20-pound bag of mulch. As parents waiting to pick up their child gathered in the courtyard, many commented on how beautiful the transformation looked. It’s great to see how much of a difference we can make when the community comes together. Volunteers from Ruppert Landscape and the Maryland Department of Natural Resources were also on hand to help plant landscape to refresh the main exterior entrance way of the schools. Design services, rentals, and paint were provided through partnerships with KNOCK Inc., United Rentals, Artsy Apple, and PAINTech Inc. With everyone’s help, students were given new books to take home while teachers enjoyed a newly renovated teacher’s lounge! Harry picked all the weeds out of the courtyard at Thomas Johnson Elementary/Middle School. George Washington Elementary and Thomas Johnson Elementary/Middle Schools are the third and fourth schools Under Armour has helped transform as part of the #WeWill campaign. To learn more about Under Armour’s philanthropic efforts, visit the brand’s platform where the community can come together to learn, engage and inspire each other, and provide opportunities to get involved and take action. We hope to see you at the next day of transformation! This website can be a walk-by way of for the entire info you wanted about this and didn’t know who to ask. Glimpse right here, and you’ll positively discover it.